Our knowledgeable California second degree murder defense attorneys at Wallin & Klarich want to share some common questions we have received regarding DUI second degree Watson Murder in California. What is the difference between second degree murder and first degree murder? In California, second degree murder is a less serious offense than first degree murder. Whereas first degree murder involves a killing that is willful, deliberate, and premeditated, second degree murder involves a killing stemming from a reckless disregard for human life. This mental state is referred to as implied malice under the California Penal Code. Essentially, if you are convicted of first degree murder, it means you planned to commit the murder. Your attorneys answer your questions regarding second degree murder as a result of drunk driving in California. You actually do not need any prior DUI convictions in order to charge you with second degree Watson Murder. The prosecution only needs to prove that had a mental state known as implied malice. However, this is much easier to prove if the prosecution has evidence of a prior DUI conviction to show that you knew the dangers of driving under the influence but chose to do so anyway. They can use a Watson Admonition or records of a court approved DUI course related to your previous DUI conviction in order to show that you had knowledge of these risks. What if other victims were severely injured in the accident but did not die? Am I subject to more punishment? Yes. If there are any surviving victims who suffer great bodily injury as a result of your conduct, you face an additional sentence of 3 to 6 years in state prison consecutive to your underlying felony sentence. If any surviving victims suffer some type of physical harm that does not rise to the level of great bodily injury, you can receive an enhancement of 1 year for each injured victim, up to a maximum of 3 years consecutive to your underlying felony sentence. California’s Three Strikes Law is designed to increase the punishment for repeat offenders who have been convicted of serious or violent felonies. Under California Penal Code section 1192.7, second degree Watson Murder is considered a “serious” felony that can count as a strike on your criminal record. If you are convicted of a second felony strike offense, your sentence will be doubled in accordance with California’s Three Strikes Law. If you are convicted of a third felony strike offense, you will serve a mandatory minimum of 25 years to life in prison. It is possible to reduce a second degree Watson Murder charge to a lesser offense? Yes. If the prosecution is unable to sufficiently prove the elements necessary for second degree Watson Murder conviction, your charge can be reduced to the less serious offense of vehicular manslaughter while intoxicated or dismissed in its entirety. If I have been charged with second degree Watson Murder, who should I call? Contact the attorneys at Wallin & Klarich if you have been charged with Watson Murder in California. 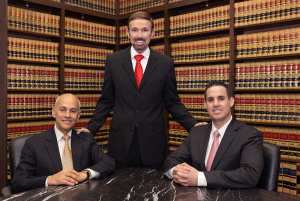 With offices in Orange County, Los Angeles, San Diego, San Bernardino, Riverside, Ventura, and Victorville, Wallin & Klarich has over 30 years of experience in successfully representing Southern California residents who have been charged with second degree Watson Murder. Drawing from extensive years of experience, we are available to answer any questions you have and are willing to go the extra mile in your defense. If you are facing prosecution for second degree Watson Murder, call our talented and professional defense attorneys today at (877) 4-NO-JAIL. We will be there when you call.